Andre Pittman and Gregory Cornes are on a mission to rid Washington of opportunistic vermin. But their target isn't corrupt officials or shady political fixers: It's literally rats. WASHINGTON (AP) — Andre Pittman and Gregory Cornes are on a mission to rid Washington of opportunistic vermin. But their target isn’t corrupt officials or shady political fixers; it’s Rattus Norvegicus, the common Norway Rat. The nation’s capital is facing a spiraling rat infestation, fueled by mild winters and a human population boom. Washington’s government is struggling to keep pace, with the pest control department fielding a record number of calls. On one recent day, Pittman and Cornes, both veteran Health Department employees, are working within sight of the Capitol, shoveling dry ice pellets into suspected rat burrow entrances. On another, they’re summoned about six blocks north of the White House, at 16th Street and M, where residents have complained of an outbreak. “Rats adapt to everything. They can be like geniuses,” Pittman said. On the grounds of a church, Cornes and Pittman poke around, expertly spotting telltale holes and matted dirt trails that signal rat burrows. Cornes uses an instrument like an extra-long Super Soaker to inject poison into the hole, while Pittman watches to see if the white powder puffs up from other holes and then shovels dirt to block those exits. The numbers don’t exactly back up Cornes’ confidence. The pest control company Orkin ranks Washington as America’s fourth “Rattiest City,” based on the number of new service calls per year. That’s up one spot from the previous year and just behind Los Angeles and New York; Chicago has been ranked No. 1 for four consecutive years. While Washington doesn’t boast New York’s famous subway monsters, anecdotal evidence is piling up that the rodents are on the march. In September, a viral video showed security camera footage of a rat pulling a fire alarm , forcing the evacuation of an apartment building. Gerard Brown, head of Washington’s rodent control department, says a string of gentle winters has enabled the rodents to breed constantly. The harsh winters don’t necessarily kill off the rats. Most Norway rats live only about eight months, and they stay warm by burrowing underground or chewing their way into basements. But an extended freeze would choke off their food supply, which limits the rodents’ prodigious breeding. A mature female rat can give birth to one litter per month, with an average of 10 babies per litter. Washington is also in the midst of a gentrification-fueled economic and population boom. The district’s population just passed 700,000 — more than Vermont and Wyoming. Brown said the number of restaurants, bars and coffee shops has increased 25 percent in two years. “More people with more money means more restaurants, which means more garbage, which means more rat food,” Brown said. Rats also covet the waterfront, and part of Washington’s gentrification boom has focused on the Navy Yards or the new Wharf Marina — presenting the ultimate rodent attraction of a flourishing waterfront restaurant scene. This isn’t even Washington’s first war on rats. Former Mayor Anthony Williams referenced rat problems in his inauguration speech in 1999. Back in 1967, a rat gnawing on power station wires knocked out electricity for about a third of Washington for nearly an hour. 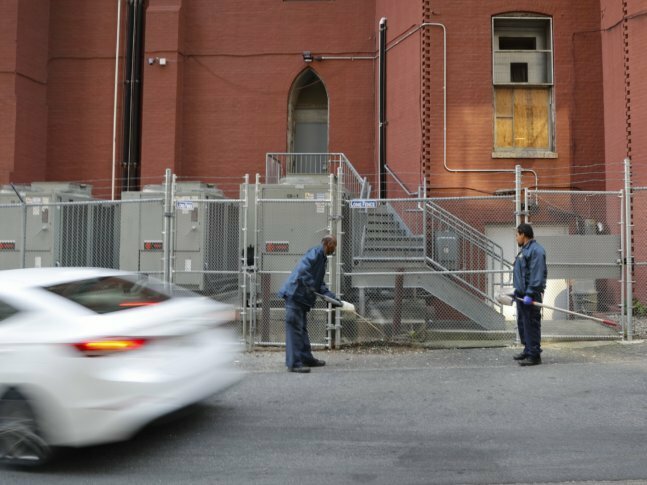 This time, Mayor Muriel Bowser has allocated an extra $900,000 to boost rodent control efforts and increase staffing. The government is also offering financial assistance and incentives for restaurants to buy minitrash compactors that fit in urban alleyways and limit the rats’ access to food. At the site near the White House, Pittman and Cornes find the real problem around the back of the office building: a collection of uncovered garbage and compost containers, plus a giant pile of discarded file cabinets — all surrounded by black pellets. “See all these droppings? All this stuff has got to go,” Pittman tells the building manager. Corrigan has consulted with Washington and other cities on rodent problems and runs free “rat academies” in Washington for both city workers and residents. Corrigan recommends a radical solution that would be logistically difficult for most major cities: picking up most trash at night. “The usual early morning pickup plays right into the hands of the rats, which are active all night long,” he said. Corrigan, not a fan of amateurs handling poisons, says the dry ice method, which suffocates the rodents in their burrows, is safe for homeowners to use. He also recommends that residents spray trash bins with a mix of water and 10 percent bleach. Beyond that, the only real solution is the hardest part of the equation — controlling human behavior.